Major purpose of this lecture is to present Relational Model. 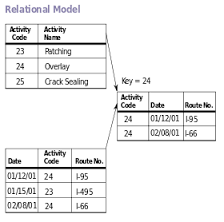 The relational model for database management is a database model based on first-order predicate logic. In the relational model of a database, all data is represented in conditions of tuples, assembled into relations. A database structured in conditions of the relational model is a relational database. This lecture also focus on Structure of Relational Databases, Relational Algebra, Tuple Relational Calculus, Domain Relational Calculus, Extended Relational-Algebra-Operations, Modification of the Database etc.